Every driver goes through a rigorous training program in the following areas: defensive driving, loading and unloading patients with care, proper procedure and use of restraint system in vehicles, developing the ability to deal with all types of patients and their needs, CPR and emergency first aid, and importance of cleanliness of vehicle and person. Every vehicle receives a detailed inspection by a state-approved inspector every 90 days. 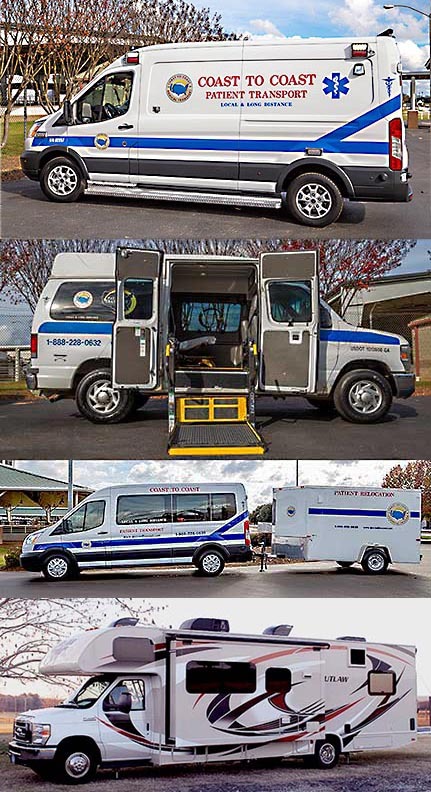 Our units are equipped with: heating and air conditioning, anti-lock brakes, stretcher and/or wheelchair restraint systems, fire extinguishers, first aid kits, bodily fluid clean-up kits, seat belt cutters, emergency flares, easy clean rubber floors, and two-way radio communication systems. Ambulances are stocked with all necessary emergency supplies including respiratory, suction equipment and all basic life support needs. Units are serviced and cleaned regularly for optimal vehicle performance. Unsurpassed in Long Distance Ground Transportation, book our RV Medical Coach. It's designed for any patient who is seeking the most comforable means to travel while being attended by medical staff. Coast to Coast guarantees you a first class experience with our seasoned, trained professionals.